WARNING: On July 17th 2013 TF2 Team posted a new Blog Post “An Active Solution to an Idle Threat” which makes it clear that idling is not supported by Valve/TF2 Team. DO NOT IDLE using the methods posted in this article or you will most likely be banned! I am leaving the information posted here for educational and historic reasons, as before this date the methods outlined here did not violate any known policies or information regarding idling in TF2. TF2 community openly idled and it was considered part of the game, however everything has changed starting on July 17th 2013. 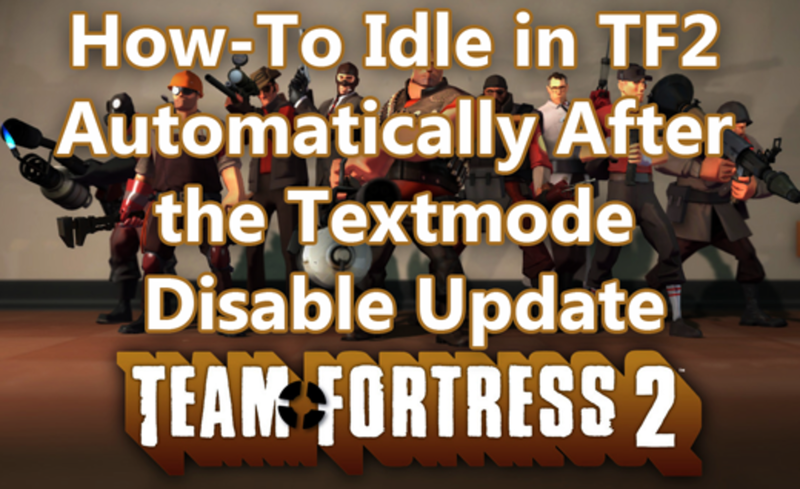 A recent update to Team Fortress 2 has disabled idling for items automatically. Textmode no longer works, each item that is dropped must be confirmed or subsequent items will not drop and sv_lan must now be set to “0”. Here is a workaround using VJoy & AutoHotkey to continue idling automatically in regular TF2. This method also works under Sandboxie with multiple instances of TF2 running. Note: Before you try this, please understand that there is a risk with using external programs. You may get banned and it is unknown at this time if Valve is enforcing a non-idling policy or not. Generally speaking AutoHotkey is a simple marco program and should in theory not cause any problems, as it does not hook into the process. Make sure you configure VJoy the same as this image. 1. Make sure VJoy is running. You can select a team and class, but in theory the script will automatically assign you to a team and class because it's the same as pressing space on every screen. Because JOY1 is bound to “kill” you will die every 60 seconds, which will cause an item drop screen to appear if you had a drop, after another 60 seconds the script will press JOY1 again and this will cause the item to be auto accepted and placed into your backpack. 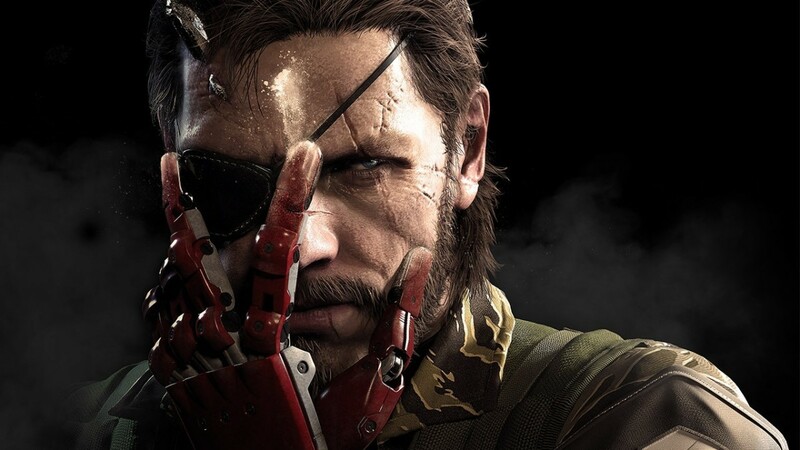 The reason why this works is because Joystick buttons are automatically processed by the game engine and input and can be issued when the game is not in focus. If you are using Sandboxie, this will work for multiple TF2 instance windows. Windows can be minimized and do not have to be active. Post a comment if this is working for you or if you have any problems. Did this method work for you? Here is an example how to startup TF2 & Sandboxie using several batch files, I don't really idle this was more of a technical challenge for me so I leave sv_cheats at 0, you can turn it to 1 if you want to use commands which lower memory usage. start C:\"Program Files"\Sandboxie\Start.exe /box:Idle "C:\Idle\client.bat"
Change the -login portion and fill in your user/pass. Change the 0.0.0.0 ip to your server ip. I don't use Sandboxie to start the server, only the client. PING 1.1.1.1 -n 1 -w 30000 >NUL is a timer technique in batch files. 30000 = 30 seconds, 2000 = 2 seconds. startup.bat works as follows: start vjoy, wait 2 sec, start server, wait 30 sec, start client, wait 30 sec, start autohotkey script. Here is an update, this method still works. There is always a risk of being banned yes, but because idling has dropped off so significantly, it really doesn't seem like Valve is going after people. I would say TF2 is also declining in userbase and key prices are once again insane. If you average 6 weapon drops a week (1 rec) for 1 account, and price of a key is say 17 ref. It will take over a year to get 1 key. Now of course maybe you'll get lucky and get a few more expensive drops, but it doesn't seem all that likley. As far as running TF2 in vmware or virtualbox, it still works as well. However linking steam data doesn't. Which means that each install of TF2 in vmware or virtualbox must be done inside the vmware environment and not system linked. I don't believe Sandboxie works anymore. Anyway I don't recommend idling, because it is a waste of time at this point. But if you still want to do it, then that's your call and technically this guide mostly works. Is there tutorial for this? Can I get ban for using this method? I just threw a space command in the ahk script. So its accepting them now. Tested it recently, It still works but you'll need to mess around with Virtual Joy and configure it as a second controller. I guess you don't monitor this anymore. But on the off chance you do. Everythings working fine. Except the ahk script working in the menus. eg scroll lock will make the button flash, but not do anything else. another thing - i can't trade with new idling accounts - do i really need to buy a game and stuff to transfer idling items? nvm, just tried to launch Big Picture - can't. looks like Big Picture can't be launched in Windows XP, and I have WinXP. So.... any fix for that? autohotkey works and sends commands to TF2 etc. but TF2 does not react to "ScrollLock down/up", even when they are bound to Button 1. Tried it with both Joystick 1 and 2. I haven't tried it in Big Picture mode yet, but I thought it was optional. I have tried using Joystick 2 and tried this outside of sandboxie neither seem to work, any chance of an updated guide ? so you are using this guide and receiving drops and haven't been penalized so far? i.e. it works fine? The guide is outdated, you need to use VJoy Virtual Joystick 2 not 1. I set up my vjoy on big pic steam, and already have the loop set. so why does this not work? It does keep turning on and off the scroll lock, but it has no effect ingame. Why is this happening? My Name & Jevuner: set VJoy Virtual Joystick 2 not 1 like this guide says. kokole: While interesting, interacting directly with TF2 like that is so risky. If you're a reverse engineer, you can bypass all checks except the VAC one (why would you bypass it anyway). - Is responding to in-game drop notifications while not utilizing external programs to do so. ^ You can call Button::DoClick from the game. - Is running only one instance of the game. Happy idling! (im saying that to myself). Could you make an updated guide on idling? hi, yesterday i tried to also use vjoy BUT it looks like its not workign anymore its not detected by steam/tf2 at all maybe they patched it cuz a lot people used it to get the beta tester badge could you may try if its still working for you somehow? But if you still decide to idle, vmware seems to be the best option combined with ahk or vjoy method. Also reports that newer versions of sandboxie may work, but I have tested it myself so unsure. It's probably not worth the trouble, but essentially it's possible to use the same steps outlined here + a windows install in VirtualBox or VMWare to idle. The only other method is to use virtualbox or multiple computers. Well, i know that's somewhat "off-topic" but, what would i have to change to mek the script press mouse2? Currently Sandboxie doesn't work, you will only get drops for 1 account because a new update is scanning for any additional TF2 processes running. Therefore Sandboxie is now useless. I do not idle myself, and only have a couple of older steam accounts with TF2 and haven't really tested mass idling or any have intention to do so. But I do test general stuff to see what works and what doesn't, VirtualBox works without problems for 1 account, I assume it is possible to run multiple VirtualBox environments. However this will require a ton of resources and by default each instances puts heavy load on the CPU around 20%, not to mention the space required for each instance to have Windows & TF2 installed and the RAM required to have everything running. It's also very easy for Valve to block VirtualBox or similar software by checking the specific video drivers virtual machines use, they can also implement methods to stop drops for the same ip address. Therefore attempting to run a cluster of virtual machines is probably a waste of time & can potentially damage your computer if you keep your CPU at a high load. It is possible to limit CPU usage by reducing available resources for the virtual machine inside VirtualBox, however this slows down the performance of the virtual machine, including long delays for booting, starting programs and may interfere with accepting drops. In my opinion Valve has pretty much ended mass idling, I don't recommend idling for the risk of any further steps they may take in the future, especially mass idling, but that's your own choice. Alexmk what does it mean? Only drops on one sandboxie account even if I sit in front of computer and do not use any other programs/scripts? idlegod is correct, it doesn't work with Sandboxie as they scan for any extra processes. However VirtualBox should work in theory. Don't bother, it has been patched again, you cannot idle more than one instance. I have the same problem as johnas. I left 2 tf2's running and no items. Hello, i did everything that you explain, i have actually 4 TF2 running with sandboxie and they get killed each minute, but i left pc turned on last night and i don't get any item. Any suggestion? You would still need to have bind joy1 kill, so the autoexec.cfg would be the same. alexmk what happens with autoexec.cfg is that removed now? 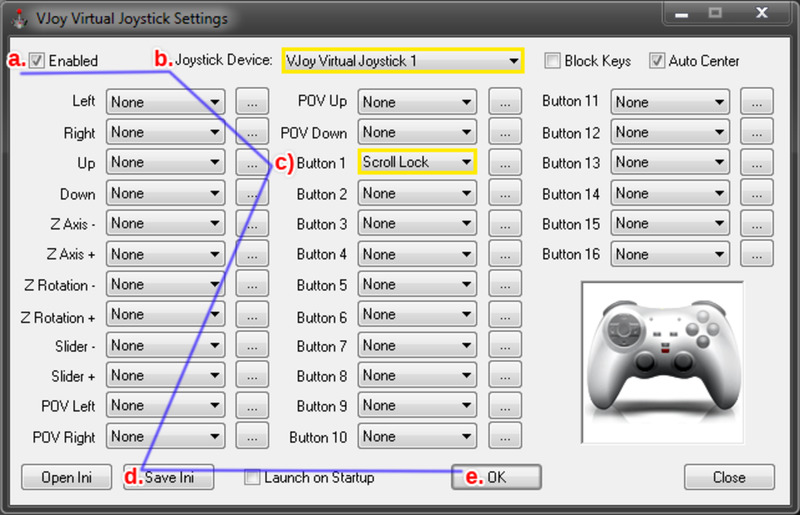 Looks like VJoy still works if you use VJoy Virtual Joystick 2 & Big Picture Mode, you need to bind at least 6 keys. Inside VJoy for "Virtual Joystick 2"
2. Select Controller, it should say "Controller Detected: VJoy Virtual Joystick"
4. Click Save, and choose No thanks for sharing configuration & exit Big Picture Mode. Scroll Lock should now work inside of TF2 as before. VJoy has been patched. Also they are now logging multiple instances of TF2, very bad idea to run Sandboxie if you are still using it. New update however appears to have fixed VirtualBox, you can now run TF2 in VirtualBox at least with -dxlevel 80. Yesterday it worked great but now (after the aug 27 update) it doesn't. It's like it's not sending the scroll commands anymore. Im having trouble getting this to work in sandboxie. I got it to work unsandboxed, but when it comes to sandboxie, i can't. please help! This method still works but it is in violation of the official policy. Nope. It is VAC-banable. That is the problem with public hacks - VAC Team will know and take actions. I heard a story that letting them know about private hack is quite... beneficial. At the moment the best way to idle with max 6 acc is to start the game and move the windows to another monitor and then do your job on the main screen. You can also buy your younger brother/sister big bag of sweets and let them "play". Man, this trick still work? So I did everything as far as I could, but I only got 1 item from each account, which makes me think that something isn't working so it's not accepting items, just getting the one. Any suggestions? AcedBalde my intention with this guide was not to hide from Valve, I made this guide before the July 17th blog post by TF2 Team. Prior to this date it was my understanding that idling was not violating any policies and that Valve was not directly against people who idle. Since idling was very active and done in the open from 2009 to july-2013. However since that date, it is very clear that they are against it and that recent changes were not unintended but purposely done to eliminate idling. Hence the notice above this article. The -dev parameter simply provides detailed information in the console. This is not a command that would create any problems. "-dev - Enables developer mode. Also disables the automatic loading of menu background maps and stops the quit dialog from appearing on exit. " I'll repeat myself one more time, I advise you don't try this method. I don't believe in censoring information and therefore I have left this article up for educational and historic purposes, but as it currently stands the method described here is in violation and you may get banned or flagged by VAC if they enforce their current anti-idle policy. I don't understand why you used -dev as a command, wouldn't that further get the attention of valve? Everything works but can you run the tf2 instances minimized? also can you will it continue idling and confirming drops if you're logged out? This method is now in violation of the official TF2 policy which is against automatic idling so I do not recommend you do this or you will possible be banned in the future. But yes when minimized it still works, but again you will probably get banned if they enforce their policy so I advise not to automatically idle anymore. One question I got everything working and it is working, but can you minimize the all of the tf2 games and will it still autohotkey? Also why is -dev mode running? TF2 idling is now dead, you will most likley be banned if you attempt to idle using any methods which automatize the process. Try alt+tab and make the window out of focus. There could be many reasons why you are not getting drops, like sv_lan not being set properly or you used up your drops or other issues. Go into regular TF2 game and play for an hour, see if you get drops and start troubleshooting from there. I've been trying this idle method but it seems that it isn't working for me. Downloaded vJoy, autohotkey. Booted it up and went into my own server with those autoexec parametres entered in console. Left the game running on but didn't find any item. Could you explain what's wrong for me or create a video tutorial, please? Are you certain that sv_lan is set to 0? Also I think vac has to be enabled to get drops. Furthermore check the console and see if you are getting any errors. L: Maybe you used up your drops or there is some other issue. Leonard: Bind kill to JOY1. You don't need to remove the old autoexec.cfg you can just add the commands in there. Question? if I already have an autoexec.cfg, do I delete old one and create new or just add new files to old one? seems to work but yet no drops. I don't think sv_cheats disables item server. Cheats can be useful for testing stuff. @ PL sv_cheats 1 disables the item server right? every time i turn on sv_cheats i get a message saying item server gets disconnected. Is that normal? what's the purpose of sv_cheats to be on? Gman: That sounds odd, does not happen to me. Not sure why you are having that issue. hey bro! thanks for the tutorial. I set it up a little differently where there was one host account and the rest connected to the server that one created. However only the one that hosted the server got the drops? mark: I don't have the issues you describe, if you run the game in windowed mode you can hold down ALT and using your mouse & click minimize instead of alt+tabbing. Scroll Lock doesn't do anything for me in Firefox, maybe check your browsers hotkeys and see if you can disable Scroll Lock as a function key. You can always use a different key, Num Lock is another one but will disable/enable your numpad. You maybe able to use a special media key on your keyboard if you find out how to reference it in AutoHotkey. Anyway best of luck. hi: Please share how you fixed your problems so people can reference it in case they have issues as well. L, sv_cheats have to be "1"
second, I am getting a "]" character in the console when the console is open, rather than the kill message. this ONLY happens when the console is open, but the console opens if I alt tab out of the active window. but fyi, as it took me a while to figure out that's that was happening. one more issue; using scroll lock has become a pain when browsing web pages. it keeps moving the page around. ill probably change it to some other unused character on the keyboard, but at least the method is sound. -novid -nosound -noipx -nopreload -nohltv -tvdisable -replay_enable "0"
-maxplayers "24" +sv_lan "0" +map "itemtest" +sv_cheats "0"
+mp_timelimit "0" +mp_idledealmethod "0" +mp_forceautoteam "1"
-novid -nosound -noipx -nopreload -nohltv -tvdisable +sv_cheats "0"
There is clearly an issue, find out if pressing scroll lock manually issues joystick button 1 press as outlined in troubleshooting guide. Matt: Joystick 1 is bound to kill yes, but Joystick 1 also does a confirm automatically when pressed. Same as space, you can bind space to anything but it will still work to confirm or accept inside menus. hi: Check my second comment from top, you need to troubleshoot your VJoy setup if having issues. i tried this but it didn't really work for me....i know that vjoy and autohotkey are working fine but when i run tf2 and then run the script it dosent work. Thanks for responding, so I don't need to confirm drops? 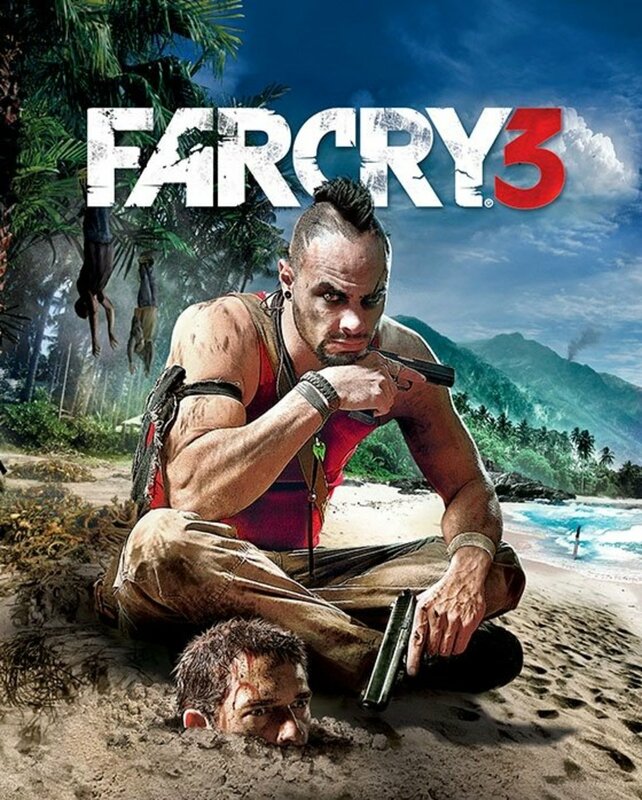 Because joystick 1 is meant to kill yes? Will this keep my drops without me confirming them? Anyway thanks for this guide, it's great! Hey Matt, this doesn't use space because it uses joystick button 1 which is FAR better as it doesn't interfere with your system and joystick button is read across all instances of TF2, so you can have many windows open press joystick 1 and it will be read by all windows. You can plugin a controller and press joystick 1/button 1 or A on 360 and you will see the same effect. Because when the notification comes up saying 'You found x!' pressing space should confirm it but it never presses space. Hey, how is it meant to keep on spamming space? I couldn't find anything in this guide to show how to do the keep on pressing space thing. nnn: Sorry not sure why you are having issue with one system, could be the keyboard or setting. forgot to mention: Im using my PC with cheap USB keyboard. Im not sure but I think the issue's from kb side because I installed vJoy on my laptop and it works just fine. joy.cpl check failed. Key 1 doesn't flash when I hit Scroll Lock on kb. What should I do? Works great without sandboxie. How to use with sandboxie? @mark: It does say sv_lan 0, it's font rendering. I will modify the font, thanks for letting me know. Someone make tutorial on youtube please.